Caerphilly Castle, the second largest Castle in Britain, was built in the 13th century and is famous for having introduced concentric castle defences in Britain. This medieval fortress is situated in the Rhymney Valley in Caerphilly, South Wales, almost a half-an hour drive away from Cardiff, and occupies around 30 acres. 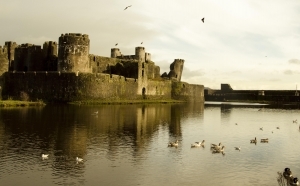 Caerphilly Castle is surrounded by two artificial lakes, and though being one of the mightiest medieval fortresses in Western Europe, the majority of it was built in just three years; between 1268 and 1271. The Castle was originally constructed by the nobleman Gilbert ‘the Red’ de Clare, Earl of Gloucester and Lord of Glamorgan, so known because of his red hair. Inheriting the family lands in 1263, when he was 18 years old, Red Gilbert, mindful of the threat of the Welsh ruler Llywelyn ap Grufudd, began building the Castle as a means of defence and as a way of subduing the region of Glamorgan. In 1265, Llywelyn allied himself with the rebel barons of England, in exchange for being granted authority over the local Welsh magnates within the region, including Glamorgan. In retaliation, De Clare allied himself with King Henry III. 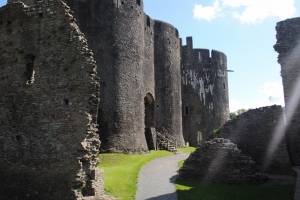 The baronial revolt was crushed and de Clare advanced into Glamorcan and started to construct Caerphilly Castle in 1268. The approach to Caerphilly Castle is not assuming, as instead of being raised on a rocky platform, as were most Castles at the time, it is hidden within a dip in a plain. The size of the Castle only becomes apparent once one crosses the first moat to the outer gatehouse. The vast structure spreads over more than 30 acres, and is known to be the second largest Castle in Britain (the first being Windsor Castle). The core of Caerphilly Castle was built by Gilbert de Clare on what became a central island, surrounded by artificial lakes. The dams to those lakes were fortified and an island to the west also provided additional protection. 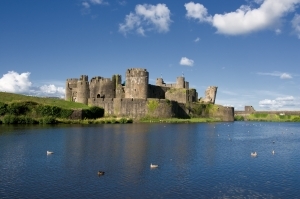 Caerphilly Castle is made up of a set of eastern defences protected by the Outer East Moat and the North Lake, as well as fortifications on the Central Island and the Western Island, which are protected by the South Lake. It is constructed on a natural gravel bank and the castle walls are built from pennant sandstone. The Castle’s architecture itself is historically significant as this Castle was the one which first introduced concentric castle defences in Britain. The Castle’s elaborate system of moats and dams is also famous. The Outer Main Gatehouse features circular towers resting on spurred, pyramidic bases. Originally this would have been reached over two drawbridges, however these were destroyed. To the North side of the gatehouse, the North Dam is protected by three chunky towers, while the South Dam, which is an astonishing 152 metres long, ends in a huge buttressed wall. The remains of the Castle mill, which used to be powered by water from the dam, can still be seen today. The dam ended in Felton’s Tower, a square fortification, and the South Gatehouse, also called Giffard’s Tower. The central island itself is made in a roughly squared shape and has a walled inner and middle ward. The inner ward is protected by four turrets, one on each corner. The walls of the inner ward overlook those of the middle ward, producing a concentric defence of two enclosed rings of walls. Today, the walls are unfortunately not as high as they were in the middle ages, due to pillaging and erosion of the stone. The concentric arrangement gave rapid access to any part of the castle through mural passages and walk-ways, attackers could be well covered and there was no possibility of mounting siege-engines around the inner walls. Another important part of the Castle is its Inner East Gatehouse, which had both exterior and interior defences, enabling it to be defended even if the perimeter of the Castle was breached. Two huge towers flanked the gatehouse on either side of an entrance protected by portcullises and murder-holes. The large size of the gatehouse enabled it to be used as an accommodation as well as defence. The Castle’s Great Hall and main accommodation are to be found inside the inner ward. In medieval times, the Great Hall was most probably subdivided with wooden screens, colourful decorations, carvings and warmed by a large fireplace. The Castle chapel is found to the east of the Great Hall, above the buttery and the pantry. The outer gatehouse on the east side is both the present and the original entrance. There, the interested visitor will find an exhibition about the Castle, and stairs leading up to the roof level, where one can enjoy a panoramic view. The inner ward is, of course, the most impressive part of the castle. The corner towers demonstrate varying degrees of preservation. An exhibition on Welsh Castles can be observed in the north-west tower. Little remains of the north-east tower however, and the south-east tower is mostly ruined. Known as the ‘Welsh Tower of Pisa’, it leans at 10 degrees to the vertical – most likely due to subsidence. The effect is very impressive. The imposing east gatehouse consists of twin D-shaped towers, a central passage with portcullises at both ends, and circular turrets on the inner corners. This was in ruins by the 19th century, but was meticulously restored by the 4th Marquis of Bute. Visiting the Castle will take around half a day, however one may wish to stroll around the beautiful artificial lakes amidst ducks, birds and swans, so it could take even more. The grounds are very well tended and offer beautiful panoramic views of the Castle. Caerphilly Castle also boasts replica parapets and working siege engines. The Castle also sports its own ghost – the Green Lady, who is believed to be Princess Alice of Angouleme, Gilbert de Clare’s wife. Apparently Gilbert found out that Alice had secretly taken the Welsh Prince, Grufudd the Fair, for her lover. A monk who knew of the affair informed the cuckolded husband. Gilbert sent his wife back to France while searching for the Welsh Prince. Grufudd, learning of the monk’s betrayal, hanged him from a tree at a site now known as ‘Monk’s Vale’, however then Gilbert’s men found him and he too was hanged. Hearing of her lover’s death, Alice died of shock on the spot, and it is said that her ghost still haunts Caerphilly Castle, wearing a green dress and waiting for her love. Last admissions are 30 minutes before closing. The Castle is closed on 24, 25, and 26 December, as well as 1 January.